More helping hands will be extended to people suffering from dementia, through community efforts that are being strengthened even as the incidence rises in Singapore with the ageing population. An estimated one in 10 people aged 60 and above has dementia, which is the gradual decline of the brain and its intellectual abilities such as thinking, memory and judgment. Half of those aged 85 and older have it. By 2030, the number of people with dementia in Singapore is expected to more than double to 103,000. As dementia plays havoc with a person's daily life, the sufferers are not the only ones who are overwhelmed, but their family members and caregivers as well. Last week, the Health Ministry said it would increase the number of dementia-friendly communities here from six to 15 in the next three years or so. The six are Yishun, MacPherson, Hong Kah North, Bedok, Queenstown and Fengshan. In these communities, many residents and businesses are trained to recognise signs of dementia and help those who might have them. 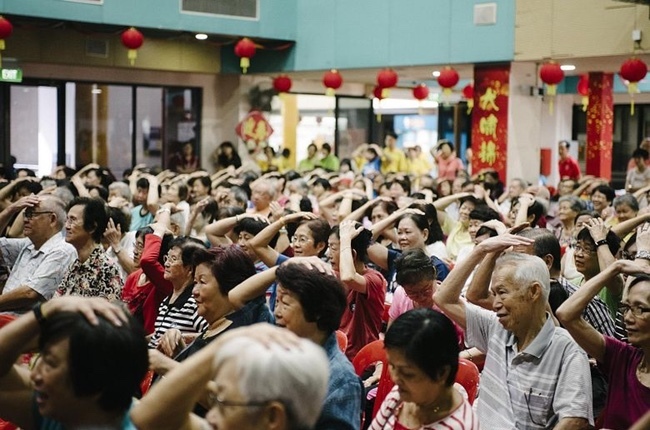 Yishun was the first so-called dementia-friendly community here, set up by Khoo Teck Puat Hospital (KTPH) and the Lien Foundation under the Forget Us Not initiative. So far, under the initiative, KTPH has provided training for about 20,000 lay people from 90 organisations nationwide. For instance, if a person with dementia takes items from a supermarket without paying, the staff will not immediately assume he is shoplifting. KTPH is also working with Apex Harmony Lodge, the first home for people with dementia here, to empower people with mild dementia to continue to lead dignified lives by engaging in work as a form of therapy to provide meaning and purpose, said Associate Professor Philip Yap, senior consultant and director of the geriatric centre at KTPH. Another community effort, which started in August last year in the western region and is set to expand, aims to help frail elderly people delay the onset of dementia through engaging in specific exercises. Being old and frail puts one at a high risk of developing dementia. More than 300 elderly folk in the west have done the exercises twice a week for at least six months at various community and senior activity centres under the Healthy Ageing Promotion Programme For You (Happy). These sessions are free. And about 100 of them have been recruited for longitudinal follow-up, to see if the exercises will help to improve their memory, and reduce frailty and associated disability, said Associate Professor Reshma Merchant, head and senior consultant at the division of geriatric medicine at National University Hospital. Demo sessions have also been held at community events all over Singapore since August, with the latest one held at the Bukit Panjang Community Club on Sunday. These are not simple exercises but dual-task activities that are adapted from the "Cognicise" programme at the National Centre for Geriatrics and Gerontology (NCGG) in Japan. "For instance, while I am marching, I am counting 30 backwards or recounting the names of fruit or hawker food that the other people here like to eat," said Prof Merchant. "These activities can be done in groups of five so this increases social interaction." In Japan, the Cognicise programme has run for more than three years, and has shown that those with mild cognitive impairment showed significant improvement in memory after doing these activities for 10 months, said Prof Merchant. "These dual-task exercises work the body as well as the mind, and encourage the person to focus on coordinating the two activities, which help with cognitive ability, preventing frailty and reducing disability." A Japanese therapist who was trained at NCGG was brought in for two years to help set up the Happy programme here. Prof Merchant said they are working with the Agency for Integrated Care to scale it up in Singapore and have plans to launch it in other parts of Singapore.